If you were an independent, adventurous, liberated American woman in the 1920s or 1930s where might you have sought escape from the constraints and compromises of bourgeois living? Paris and the Left Bank quickly come to mind. But would you have ever thought of Russia and the wilds of Siberia? This choice was not as unusual as it seems now. As Julia L. Mickenberg uncovers in American Girls in Red Russia, there is a forgotten counterpoint to the story of the Lost Generation: beginning in the late nineteenth century, Russian revolutionary ideology attracted many women, including suffragists, reformers, educators, journalists, and artists, as well as curious travelers. Some were famous, like Isadora Duncan or Lillian Hellman; some were committed radicals, though more were just intrigued by the “Soviet experiment.” But all came to Russia in search of social arrangements that would be more equitable, just, and satisfying. And most in the end were disillusioned, some by the mundane realities, others by horrifying truths. Mickenberg reveals the complex motives that drew American women to Russia as they sought models for a revolutionary new era in which women would be not merely independent of men, but also equal builders of a new society. Soviet women, after all, earned the right to vote in 1917, and they also had abortion rights, property rights, the right to divorce, maternity benefits, and state-supported childcare. Even women from Soviet national minorities—many recently unveiled—became public figures, as African American and Jewish women noted. Yet as Mickenberg’s collective biography shows, Russia turned out to be as much a grim commune as a utopia of freedom, replete with economic, social, and sexual inequities. American Girls in Red Russia recounts the experiences of women who saved starving children from the Russian famine, worked on rural communes in Siberia, wrote for Moscow or New York newspapers, or performed on Soviet stages. Mickenberg finally tells these forgotten stories, full of hope and grave disappointments. "Julia Mickenberg's extensive research in US and Russian archives fills a significant gap in our knowledge of the roles played by US women in the Russian revolution and the Bolshevik and Stalinist regimes in the Soviet Union. This book is also an invaluable contribution to transnational American studies, because it treats US-Soviet political and cultural relations between 1905 and 1945. Long considered the purview of international relations and political scientists, the transnational connection of Americans and Russians in this period is actually a fascinating story of mutual influences." "In this well-researched and wonderfully written volume, readers will find a story that has long been overlooked." "Mickenberg paints a vivid picture of the postrevolutionary Soviet Union as a society working to live up to lofty, and ultimately unrealized, ideals. . . . Mickenberg tells a relatively unknown story of the time in between, of the new woman’s disappointments with America and her enthusiasm for Russia, and she does so with rich archival research and in beautiful prose. Graduate students and scholars of early-twentieth-century American feminism and the cultural history of Soviet/U.S. relations will be most interested in this book." “American Girls in Red Russia combines incredible research and inspired writing in a compelling account of the American women who traveled to, lived in, and sometimes believed in the Soviet Union during its first decades. Mickenberg deftly combines political and cultural history to reveal a fascinating generation of radical women who chased ‘the Soviet dream.’ She transports the reader into the lives of both famous and forgotten women who followed their curiosity and convictions to a brave new world. Sometimes they found fulfillment; more often, disappointment. Their stories enrich our understanding of early feminism at home and in the USSR while revealing the possibilities and limitations of living revolutionary lives." "Julia L. Mickenberg's American Girls in Red Russia is a tour de force of rich storytelling, impressive research, and well-developed characters. . . . Beyond being a powerfully researched piece of scholarship that contributes to our understandings of American and Soviet culture in the 1920s and 1930s, American Girls in Red Russia has captured the spirit and excitement of these women as they set out to carve new identities for themselves. She makes readers care about these women, their dreams, their fates, and most importantly, their cause." "[Mickenberg] recovers a lost piece of social history with this absorbing account of the adventurous American women who went to live in the Soviet Union after the Bolshevik Revolution." "meticulously researched and well-written . . . [Mickenberg] skillfully and sympathetically portrays the complicated experiences of the women, including the increasing clashes of dreams and reality as the period ended." materials – memoirs, diaries, correspondence. . . . a valuable contribution to knowledge about American women who pursued their ‘Red dream’ through their activism and contributing to the revolutionary society." "Mickenberg’s book successfully captures the real depth of interest, hope, and fascination that the Soviet Union held for many well educated, left-leaning American women . . . She provides a fascinating account of these women’s willingness to uproot their lives in search of careers, sexual liberation, and the ability to participate in the construction of a new communal society, contrasting the opportunities the Soviet Union offered with the limitations these women faced at home." "organized and carefully researched . . . an essential window into a past repressed by McCarthyism." "American Girls in Red Russia offers a cadre of women whose cultural contributions are worthy of rediscovering. . . . Mickenberg positions herself as a child of the Cold War, among the members of Generation X in the United States who had a romantic and ambivalent relationship with the Soviet Union. Her research begins to fill a gap in the literature that not only brings to light the social and cultural contributions of American women in Russia and the Soviet Union but also considers the impact of socialism on the US Left. The current cultural moment can only benefit from the insights of Mickenberg’s work." 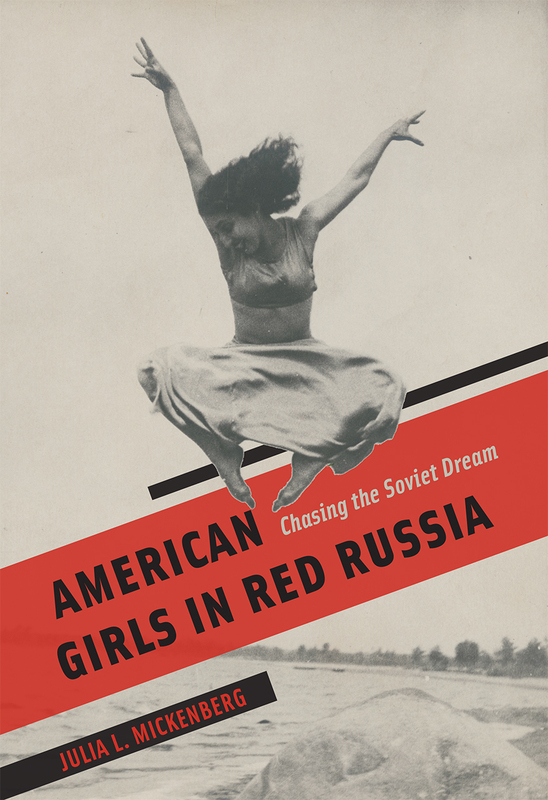 "Stories of women who left the United States for the Soviet Union in the 1920s and 1930s offer long-forgotten case studies in personal motivation and the meaning of success in Julia Mickenberg’s new book, American Girls in Red Russia: Chasing the Soviet Dream." "Mickenberg’s lucid and informative work . . . will strike specialist and general audiences alike as fascinating, surreal and riven with the complexities of the human experience." "Fascinating. . . . Mickenberg has done truly comprehensive research. . . . Her important monograph enriches our understanding of the complicated relationship between Russia, women of the American left, and the Soviet revolutionary ideal and its reality."